Last Thursday I was up bright and early, well it actually wasn’t that bright, but it was early. I wanted to welcome in Spring and get a jump on wearing less clothing, mostly in particular no tights or hose. After dressing quickly I rushed to the door to check out the weather, although there was still snow on the ground it wasn’t blustery cold as it had been only a few days earlier. It felt good not to have to wear tights or hose and to be able to put on a short sleeve T-shirt was even better. I purposely thrifted this black T-shirt after seeing Ms. Looking Good in her white one. 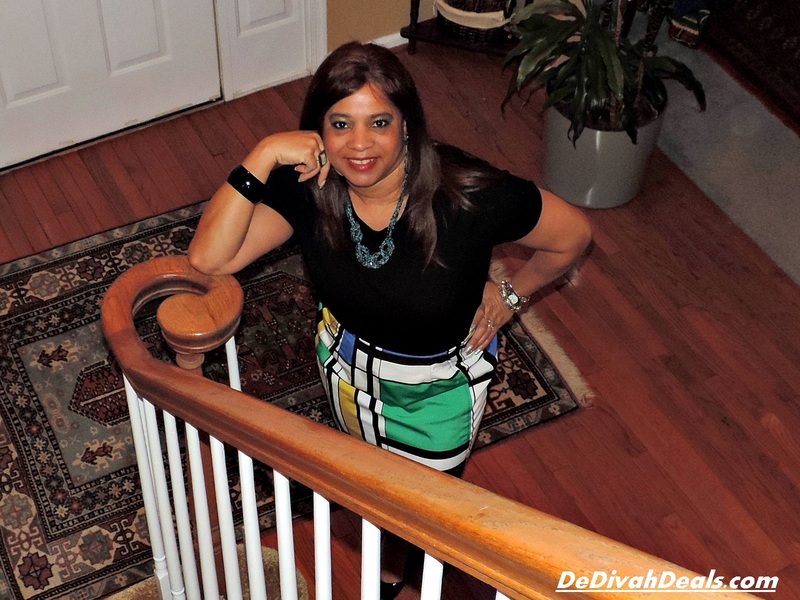 Prior to reading her post, I would have never thought to wear a t-shirt with a skirt or even to work, but I like the look – what do you think? You remember these thrifted black patent leather ankle shoes. 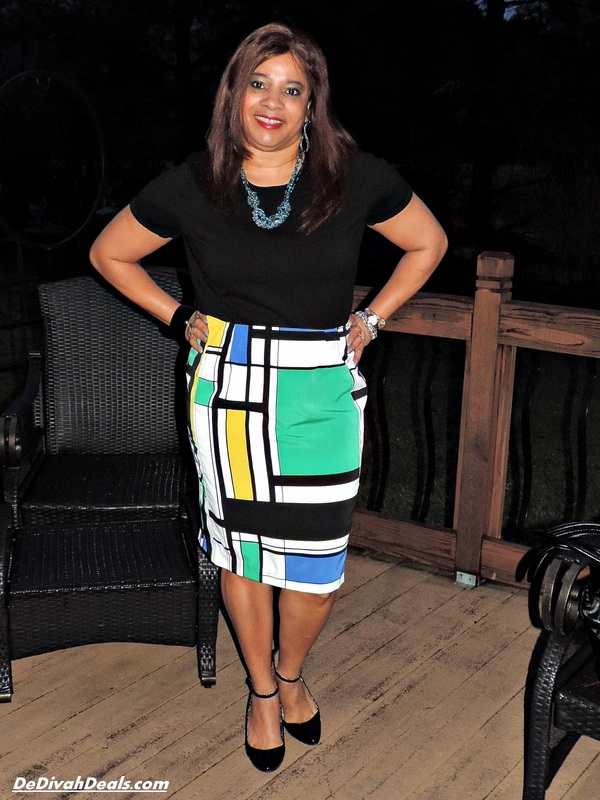 The geometric skirt was a clearance sale bargain from JC Penney. The necklace and earring set is from Jewelrymax.net, they have some great costume jewelry. Have you ever been inspired by another blogger’s outfit? What are you looking forward to shedding from your winter wardrobe? I’m loving that skirt! The colors are perfect! JCP really has stepped up their game when it comes to fashion/style. Great find! Yes, and I love their clearance racks! Hope you are having a terrific Tuesday! I am looking forward to shedding my sweaters! It’s still a little chilly in Atlanta, so I can’t wait for spring! You look so pretty and fresh in these colors, great outfit! Thank you, we are getting snow flurries, but hopefully by this time next week it will be warm! I am inspired by my blogger pals each and everyday. I had a blog for three years and did not post any photos of myself. Thanks for the inspiration! That skirt is a must have and you are wearing it very well. Love the photo of you at the staircase. Enjoy Spring!! Good for you, it’s fun isn’t it? I will enjoy Spring as soon as decides to stay…can you believe it snowing again today! I love the look Antionette! I need to start wearing high waisted skirts more. JCP has definitely stepped up their game fashion wise. I don’t really follow fashion bloggers. I’m more of following beauty bloggers on Instagram. Thank you, I have always loved JCPenny’s Worthington Collection, and their clearance sales are awesome. I haven’t been there in a while because I love thrifting, but may have to take a look next week. Have a wonderful Wednesday tomorrow. Wow, what a great compliment that has really made my day, evening, and night!!! Thank you my dear bloggy friend. Have a wonderful Wednesday tomorrow. Well you look fantastic. I love the way you paired that skirt. Looks great. What a great way to welcome spring, with a fabulous outfit. Thank you, I had never thought to wear a t-shirt other than on the weekend, but I will now thrift a few more, perhaps in different colors. Have a wonderful Wednesday. Looks great!! I am looking forward to putting winter boots away for good! I couldn’t believe I woke up this morning to more snow! I know…and it’s cold!!! Maybe next week? Thank you my dear, I do appreciate you and value your opinion. Happy Hump Day Wednesday. 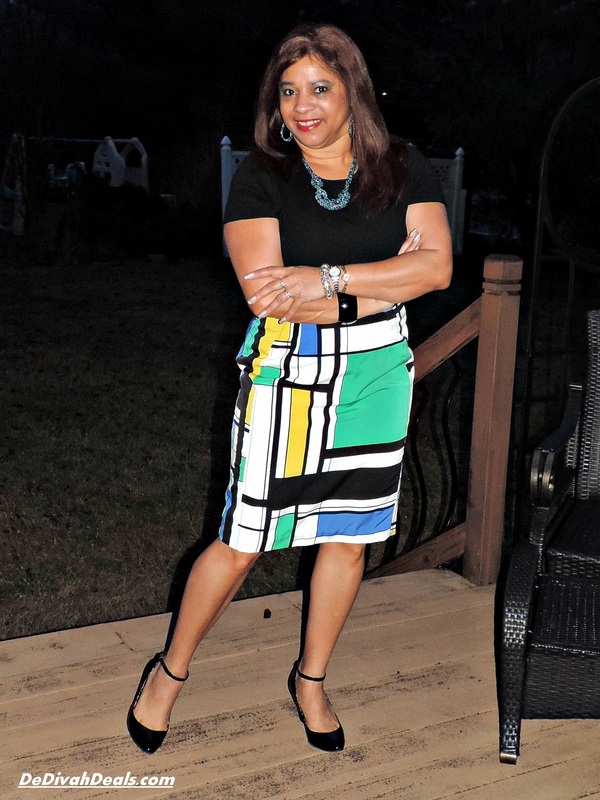 Great Spring outfit…loving the graphic skirt! The skirt looks fantastic on you. Great way to start off Spring! Thank you, need to thrift a few more colorful ones. Have a wonderful weekend. You look amazing Antionette! I love the JC Penney skirt. What a way to pump up the t-shirt look with those colors. 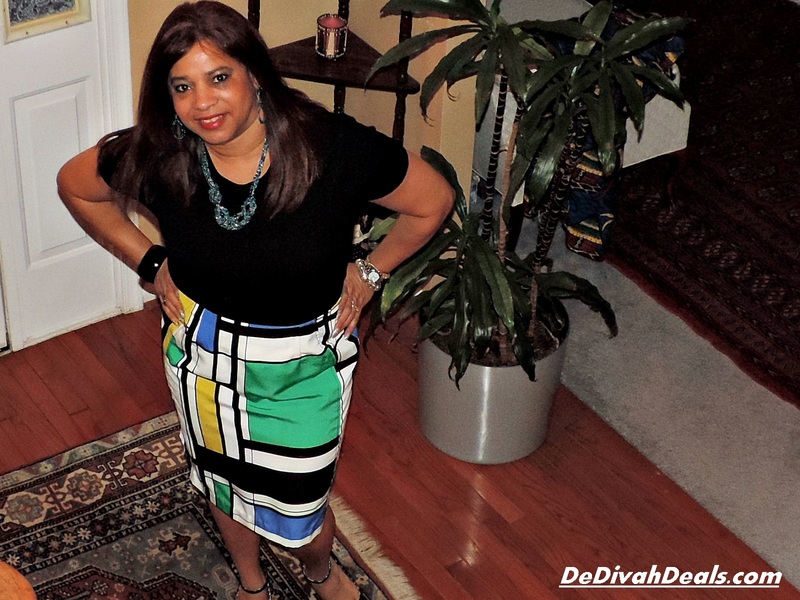 I’m on the look-out for bold colors and prints every time I visit Goodwill or my local thrift shops. It’s hard to find them bec I’m sure they get snapped away quickly. Thanks for the sweet shout-out too 🙂 Enjoy your Sunday! Thank you for giving me the inspiration!!! that skirt is cute cute cute!